breeders, claiming that the problem is only in rural areas. But I ask, why would requirement of such basic needs of animals be a problem? It seems that a reputable breeder would support such an ordinance. It’s difficult to gauge the prevalence of puppy mills in Utah, which typically run beneath the radar and so are not regulated. This, combined with selling dogs via the internet, enables backyard breeders to essentially run rampant. You may help this problem by keeping an eye (and ear) out for anyone who appears to be breeding dogs. We need more watch groups and legislation protecting animals, not less. Utah is one of a handful of states that makes it illegal for “whistle blowers” to take photographs of inhumane treatment of animals on factory farms. Really? So, I’m going to be arrested and fined for documenting the suffering of an animal so I may perhaps make its dreary life at least somewhat comfortable before it's slaughtered? A surprisingly backward stance considering that we have fairly strong animal rights faction (in SLC anyway). 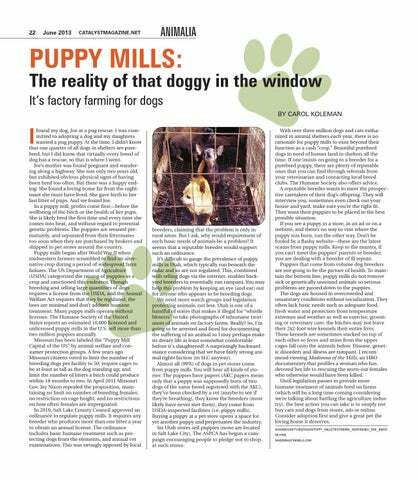 Almost all (99%) of dogs in pet stores come from puppy mills. You will hear all kinds of stories: The puppies have papers (AKC papers mean only that a puppy was supposedly born of two dogs of the same breed registered with the AKC), they’ve been checked by a vet (maybe to see if they’re breathing), they know the breeders (most likely have never met them), they come from USDA-inspected facilities (i.e. puppy mills). Buying a puppy at a pet store opens a space for yet another puppy and perpetuates the industry. Six Utah stores sell puppies (none are located in Salt Lake City). The ASPCA has begun a campaign encouraging people to pledge not to shop at such stores.